Neighbourhood Watch in Victoria was started when it was realised that the Police alone could not control the rising crime rate, in particular burglary and related thefts. The support of the public was sought to help reduce crimes such as burglary and theft which resulted in a pilot area opened on June 15, 1983 in Kananook, a suburb of Frankston. 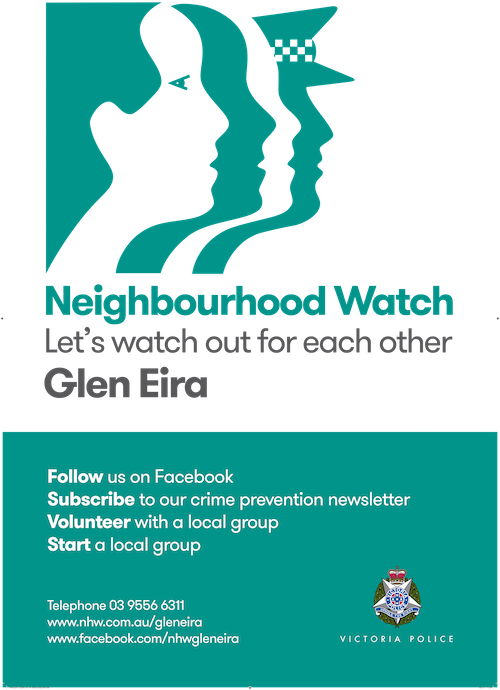 For 35 years the program has been successful in preventing crime and there are now Neighbourhood Watch groups servicing both city and rural locations in more than half of the 79 Local Government Areas, with Glen Eira being one of the first. There are a further (estimated) 70,000 people connecting to Neighbourhood Watch Facebook Pages and Groups across the State. Working with a dedicated team of volunteer Glen Eira locals, we care about YOU (the community) and truly believe that NHW presented on a Social Media Platform is innovative and appropriate for today and the future. NHW Glen Eira is now sharing information quicker than ever before with the ability to invite community interaction. With a facebook page, we have wider appeal to a larger demographic providing up-to-date relevant information to share in a timely manner. Some areas within Glen Eira also have dedicated individuals who still print & distribute a paper newsletter – so some residents have access to both. NHW focuses on Crime Prevention, community awareness, & the best tips for your safety & security, highlighting the need to watch out for each other, particularly our elderly neighbours. What are the main strategies of Neighbourhood Watch?